Aikido Tensho-Kai (合気道天照会) is Aikido School located in Yokohama, Kanagawa. Aikido is the modern martial arts, which called "Budo," based on the Traditional Japanese martial arts. Aikido in Tensho-Kai takes the practical techniques with floating motion and harmony. The school is open for all generation from kids to seniors. Time: 7:20 p.m. to 8:40 p.m. Date: First and Third Thursday and 2nd and 4th Tuesday. 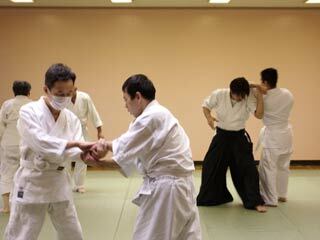 Aikido is the modern martial arts. Tensho-Kai pursues its Aikido as the practical self-defense with a harmony of body and mind. Tensho-Kai's Aikido is the way of making friends, by respecting others and the founder, O'sensei. We train physical body strength, and mental stability. Tensho-Kai focuses at "Ukemi, break-fall," as the most important skill to save your body and keep body in healthy and great condition. Our training makes your body soft and flexible in each joints. This Ukemi skills are the most practical skills which you can apply in your daily life. The techniques are designed in practical use which mostly based on humans body structures. Our main focus are using entire body at once to create huge amount of power in total, controlling the balance and concentrating on own breathing. Aikido training is like "making all of the technique high-practica and high-destructive, and train the mind harder than the techniques for not using them to hurt others." When you have strong martial arts skills, you will feel like to use them to the others. Aikido is training mental strength which takes all those unnecessary desire away from the mind.